Manuel, the young shrimp-picker, five years old, and a mountain of child-labor oyster shells behind him. He worked last year. Understands not a word of English. Dunbar, Lopez, Dukate Company. Location: Biloxi, Mississippi. 1911 February. Child Labor Defined: Historically, “child labor” is defined as work that deprives children of their childhood, their potential and their dignity, and that is harmful to physical and mental development. However, not all work done by children should be classified as child labor. Children or adolescents’ participation in work that does not affect their health and personal development or interfere with their schooling is generally regarded as being something positive. This includes activities such as helping their parents around the home, assisting in a family business or earning pocket money outside school hours and during school holidays. Abusive Child Labor: What is to be prevented is child labor in its most extreme form: Children being enslaved, separated from their families, exposed to serious hazards and illnesses and/or left to fend for themselves. Forms of extreme child labor existed throughout American history until the 1930s. In particular, child labor was rife during the American Industrial Revolution (1820-1870). Industrialization attracted workers and their families from farms and rural areas into urban areas and factory work. In factories and mines, children were often preferred as employees, because owners viewed them as more manageable, cheaper, and less likely to strike. Historical documents revealed American children worked in large numbers in mines, glass factories, textiles, agriculture, canneries, home industries, and as newsboys, messengers, bootblacks, and peddlers. In the latter part of the nineteenth century, many labor unions and social reformers advocated aggressively for state and local legislation to prevent extreme child labor. 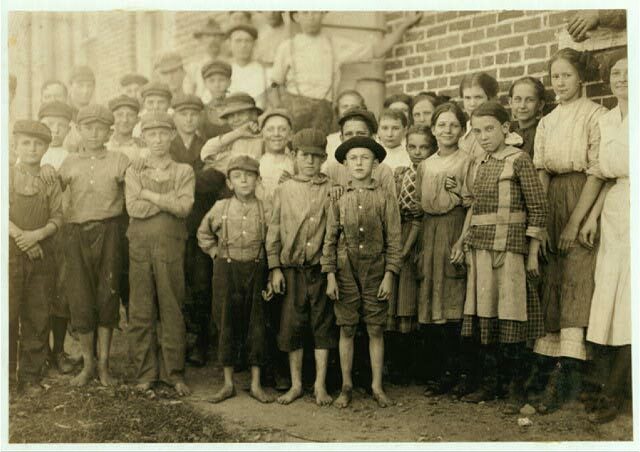 By 1900, their efforts had resulted in state and local legislation designed to prevent extreme child labor; however, the condition in states varied considerably on whether they had child labor standards, their content and the degree of enforcement. The lucky ones swept the trash and filth from city streets or stood for hours on street corners hawking newspapers. The less fortunate coughed constantly through 10-hour shifts in dark, damp coal mines or sweated to the point of dehydration while tending fiery glass-factory furnaces – all to stoke the profit margins of industrialists whose own children sat comfortably at school desks gleaning moral principles from their McGuffey Readers. By and large, these child laborers were the sons and daughters of poor parents or recent immigrants who depended on their children’s meager wages to survive. But they were also the offspring of the rapid, unchecked industrialization that characterized large American cities as early as the 1850s. In 1870, the first U.S. census to report child labor numbers counted 750,000 workers under the age of 15, not including children who worked for their families in businesses or on farms. By 1911, more than two million American children under the age of 16 were working – many of them 12 hours or more, six days a week. Often they toiled in unhealthful and hazardous conditions; always for minuscule wages. Young girls continued to work in mills, still in danger of slipping and losing a finger or a foot while standing on top of machines to change bobbins; or of being scalped if their hair got caught. And, as ever, after a day of bending over to pick bits of rock from coal, breaker boys were still stiff and in pain. If a breaker boy fell, he could still be smothered, or crushed, by huge piles of coal. And, when he turned 12, he would still be forced to go down into the mines and face the threat of cave-ins and explosions. Child Labor Reform: In the early decades of the twentieth century, the numbers of child laborers in the U.S. peaked. Child labor began to decline as the labor and reform movements grew and labor standards in general began improving, increasing the political power of working people and other social reformers to demand legislation regulating child labor. Union organizing and child labor reform were often intertwined, and common initiatives were conducted by organizations led by working women and middle class consumers, such as state Consumers’ Leagues and Working Women’s Societies. These organizations generated the National Consumers’ League in 1899 and the National Child Labor Committee in 1904, which shared goals of challenging child labor, including through anti-sweatshop campaigns and labeling programs. Since 1900, there have been several efforts to regulate or eliminate child labor. One of the primary leaders in this effort was the National Child Labor Committee, which was organized in 1904. The National Child Labor Committee and various state child labor committees were gradualist in philosophy, preparing them to accept whatever was achievable even if it was not sufficient. They used flexible tactics and were resilient in the face of defeat and slow progress. Furthermore, these committees pioneered the usage of mass political action, including expert investigation, photography, pamphlets, leaflets, mass mailings, and lobbying. However, their success was dependent on the political climate of the nation overall, as well as developments that reduced the need or desire for child labor. The National Child Labor Committee campaigned for tougher state and federal laws against the abuses of industrial child labor, and Lewis W. Hine was its greatest publicist. A teacher who left his profession to work full-time as investigator for the committee, Hine prepared a number of the Committee’s reports and took some of the most powerful images in the history of documentary photography. The Library of Congress holds the papers of the Committee, including the reports, field notes, correspondence, and over 5,000 of Hine’s photographs and negatives. This album depicts children at work in canneries and is accompanied by a follow-up report for a group of canneries previously investigated by Hine. From 1911 to 1916, Hine traveled across southern and eastern states capturing thousands of unflinching images that exposed the heartless treatment of children. More often than not, Hine had to resort to trickery to gain access from resistant, even hostile, employers. He posed variously as a Bible salesman, industrial photographer, fire inspector and insurance agent to get candid shots, sometimes with a hidden camera. Children might be removed from view before he arrived or he might be barred from the premises altogether. When Hine couldn’t find a way in, he waited outside the gates and photographed the children as they entered and exited. The tireless efforts of reformers, social workers and unions seemed to pay off in 1916 – at the height of the progressive movement – when President Woodrow Wilson passed the Keating-Owen Act banning articles produced by child labor from being sold in interstate commerce. The act was struck down as unconstitutional by the Supreme Court just two years later. 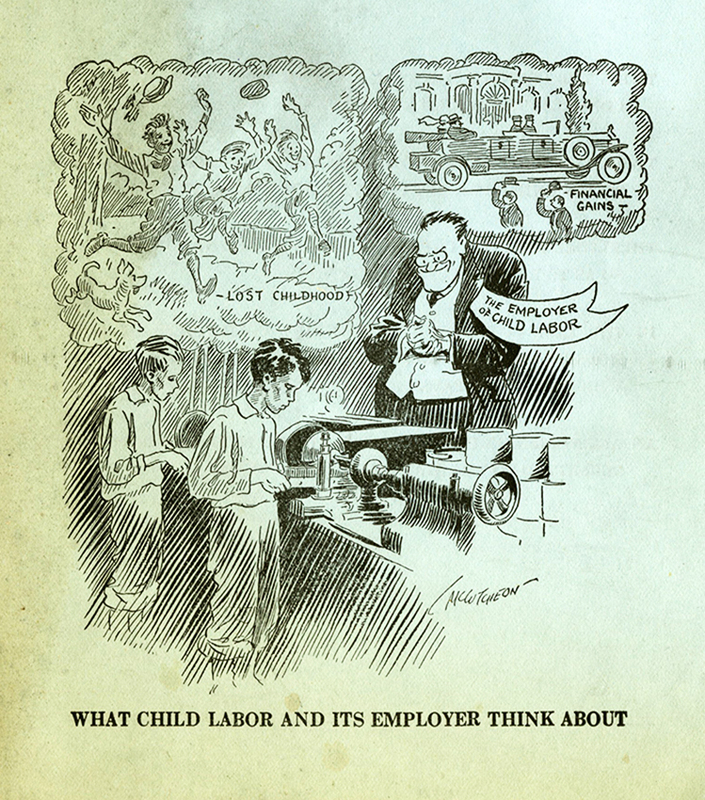 Between 1902-1915, child labor committees emphasized reform through state legislatures and, as a result, many laws restricting child labor were passed. However, gaps remained, especially in the south. This led to a push for a federal child labor law, which Congress passed in 1916 and 1918, but the Supreme Court declared them unconstitutional. Opponents of child labor then sought a constitution amendment to authorize federal child labor legislation. Congress passed the amendment in 1924, but many states failed to ratify this amendment due to the conservative 1920s political climate and opposition from some church groups and farm organizations that feared increased federal power. The Great Depression catalyzed changes in political attitudes in the United States, especially surrounding child labor. President Franklin D. Roosevelt’s New Deal sought to prevent extreme child labor, and almost all of the codes under the National Industrial Recovery Act significantly reduced child labor. The Public Contracts Act of 1936 required boys to be 16 and girls to be 18 to work in firms supplying goods under federal contract. The Beet Sugar Act required children to be 14 to work in cultivating and harvesting sugar beets and cane. The Fair Labor Standards Act of 1938 (FLSA) set the minimum working age at 14 for employment outside of school hours and 16 during school hours. Furthermore, non-agricultural work in interstate commerce required a minimum age of 16 during school hours and 18 for positions designated as “hazardous” by the secretary of labor. Overall, these laws were successful, not only to the generally widespread disapproval towards child labor, but also because many previously unemployed adults became employed once children were limited in the workforce. 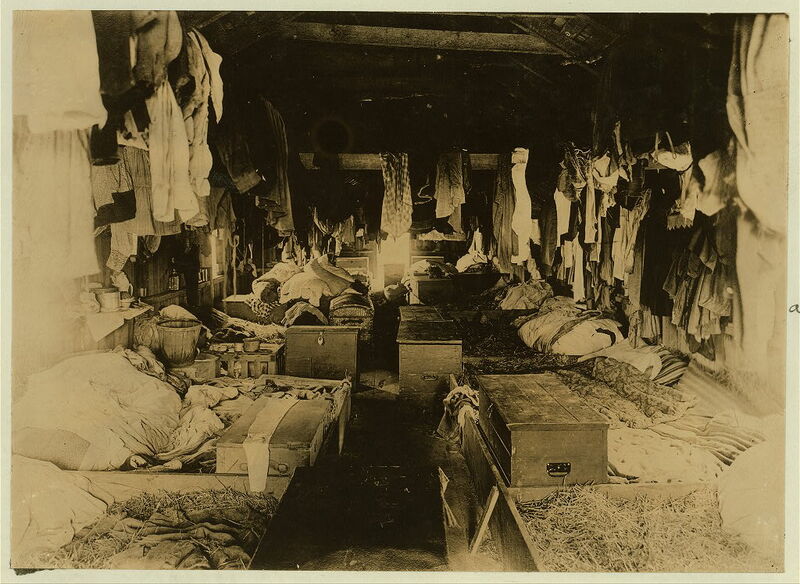 Interior of a shack occupied by berry pickers. Anne Arundel County., Maryland. Courtesy of Maryland Child Labor Committee. See also the Child Labor Discovery Set. Hello: When was the McCutcheon cartoon published? It is a great cartoon. Thanks! The cartoon comes from a pamphlet that you can see in the Image Portal. We don’t have a specific date, but probably around 1920. Certainly before 1924 when the amendment was passed. If you’re able to discover anything more specific, please let us know! Yes, this is excellent for all of these school projects, but more importantly to know that this part of our history existed and was the root of much heartache, sadness, cruelty, and suffering. We must learn from this, protect our children, and find a way to address poverty and homelessness. These conditions have been corrected via legislature and child labor laws and oversight, but there is still gross neglect of immigrant and underage workers here in the US and around the world it is rampant. Most of what we consume here in America is made by factories abroad that practice slave labor. Thanks, I needed this for a NHD project! Website is dope af… Helped me out a lot! Great website! Helped me so much with my project!! Thank you!